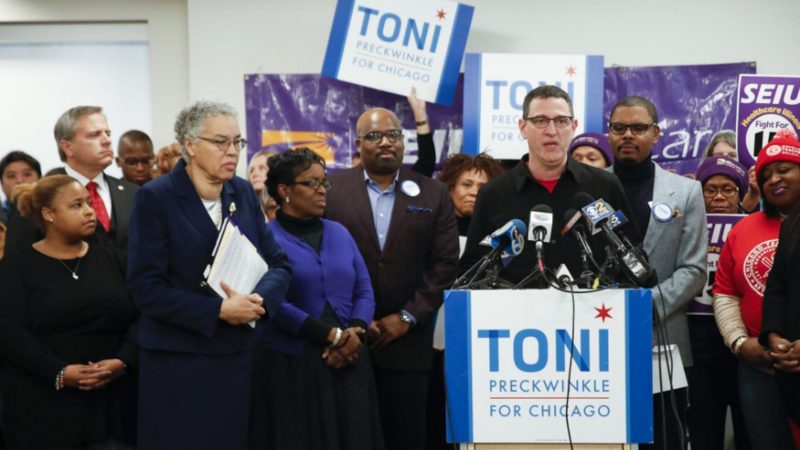 Chicago Teachers Union (CTU) officers urged delegates to support the union's endorsement of Cook County President Toni Preckwinkle for Chicago mayor in the Feb. 26, 2019, election. While acknowledging her connection to indicted alderman Edward Burke, President Jesse Sharkey said, "It's not a perfect world." VP Stacy Davis Gates spoke about going with the candidate who shares our interests. CTU President Jesse Sharkey endorses Toni Preckwinkle for mayor at a press conference in December 2018. Preckwinkle's education policy agenda calls for an elected Chicago Board of Education, plus a freeze on school closings and the expansion of independently operated charter schools. "The CTU's elected House of Delegates voted to endorse Preckwinkle in early December," a January CTU press release stated. "That endorsement was driven by her commitment to an elected, representative school board, a moratorium on school closures, an end to charter expansion, and progressive new revenue to adequately support neighborhood public schools that can truly function as sustainable community schools." The report of the CTU’s House of Delegates meeting held on February 6, follows, beginning with the pre-meeting open mike, question and answer period beginning at 4:15 p.m.
A delegate began by asking about a disparity at her school. At the end of the day kindergarten and first grade teachers have to wait until parents pick up their kids while other teachers can leave immediately when the school day ends. This wait is usually only a few minutes. CTU President Jesse Sharkey suggested they try to work out something through the PPC. A delegate from Garvey school stated they had the same problem so the principal allowed the teachers to get the kids ready 5-10 minutes early and it worked out fine. Problem solved. The Garvey delegate complained on the difficulty in navigating the CTU’s website; that in trying to reach a particular staffer her computer instead was flooded with news articles about the person she is trying to reach. Nate Goldbaum responded by saying that the new site is a work in progress and he would try to simplify things. One delegate asked what dollar amount the CTU is asking for in contract negotiations. Jesse said that the initial demands are for an overall 5% raise and a one year contract. The delegate from Juarez School was concerned as one of his co-workers was is a victim of domestic violence and is now living outside of the City. She had requested a waiver on the residency requirement, but the CPS has been dragging its feet. Jesse will contact the CPS and try to get them to act quickly on the matter. With the schools being closed two days last week due to the dangerously cold weather, the CPS is planning on making up those days later in the year and not paying employees at this time. The pay will be issued when the days are made up. The delegate, and Jesse, agreed that employee paychecks should be paid in full now with the cold days pay subtracted at the end of the school year. The CTU will be arguing with the CPS over this. PSRPs are allowed to cover classes in an emergency for no more than one hour a day but due to the sub shortage they are covering some classes all day. The delegate who brought this up was referred to a Field Rep to file a grievance. At McCutcheon School, PSRPs and SECAs were being made to do office work. SECAs are supposed to be in the classrooms and those the kids are being hurt when the SECAs are diverted to other, improper tasks. Again, the CTU is proceeding to follow the grievance route on this. Some clinicians were in Springfield last week for a CPS approved conference, but the CPS is refusing to pay them since the schools were closed. Jesse will contact the CPS to try to resolve this. Another delegate complained about the length of the January House of Delegates which dealt with proposed contract demands and lasted until 9:45 p.m. Jesse recognized the problem and suggested that next time perhaps the CTU should plan on two meetings. Lastly, a delegate asked if every kid in a class has to be taken on a field trip. Apparently, in this school’s case, there are some students who are disruptive on field trips. Jesse said that since the field trip is part of the educational experience, the principal can insist that every student be given the opportunity to participate in such trips. At this point the regular meeting began at 4:48 p.m.. The CTU presented its contract demands to the CPS on January 17. CTU is planning on having three regional meetings for the membership to attend to discuss the demands as the talks progress. The meetings are February 12, 4-6 p.m. at Dyett High School, 555 E. 51St., February 19, 3:30-5:30 p.m. at Schurz High School, 3601 N. Milwaukee, and February 21 at Kelly High School, 3:30-5:30 p.m., 4136 S. California. Attendance is open to the membership. Wear red. Normally, the Executive Board asks the House to cancel its regular meeting in March in lieu of the annual delegate’s workshop However, the E-Board was very divided on this issue this year so there will be a House of Delegates meeting on Monday, March 11. CTU members on the picket line at Chicago International Charter School Wrightwood faced intimidation by CICS administrators from their downtown headquarters. “They intimidated our parents by telling them students would be marked absent and that it would be almost like a black mark against them,” Wrightwood English teacher Dorothy Underwood said. “They bullied us in the picket line.”The CTU members of the Chicago International Charter Schools (CICS) are on strike right now. At the Wrightwood School location, (81st and California) police were called out numerous times to threaten and intimidate the strikers. The strikers were told they would be arrested if they stood on the public sidewalk, used a bull horn, or tried to talk to parents taking their kids into the building. A noise ordinance forbids the use of a bullhorn until 8:00 a.m. (and the teachers were using it at 8:15 a.m. when the police threatened them). Talking to parents and using the sidewalks are civil rights and the teachers refuse to be intimidated. 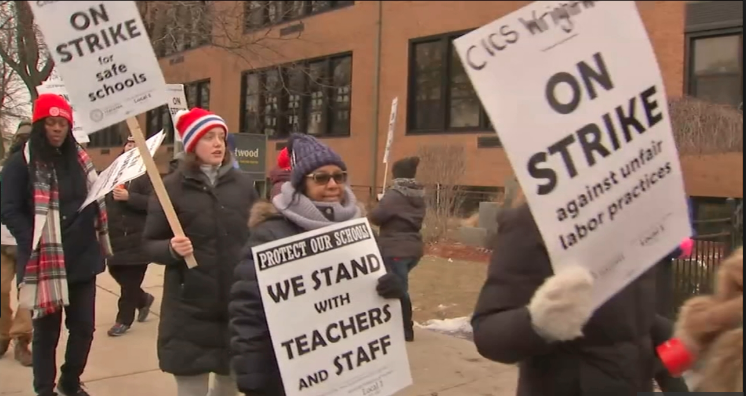 Chicago Teachers Union officials said CICS network leaders phoned in about their legal picket line outside Wrightwood Elementary on the Southwest Side, and brought CICS administrators from their downtown headquarters to “intimidate” parents and strikers. Police officials said officers were called about 7:35 a.m. regarding a disturbance blocking the school’s parking lot entrance. The officers spoke with protesters and school administrators, and the entrance was cleared without incident, according to police. A spokeswoman for Civitas Education Partners, the firm that manages the charter network, said it was a nearby resident who called police to complain about the noise of the protesters’ megaphone. The CTU is hosting an indoor rally in support of the strikers on Saturday, February 9 from 1:00 to 3:00 p.m. at the Union building at 3901 W. Carroll. One of the CICS strike leaders, Ms Crowley, said that the CICS has $36 million in its reserves which is much more than enough for those schools to have a financial cushion. She also said that the CICS CEO, Elizabeth Shaw, left the day the strike began for two weeks in Hawaii, taking with her a personal photographer. Financial Report – Kathy Catalano. Kathy pointed out that as of November 30, 2018, for the first five months of the CTU’s fiscal year, the Union is operating with a deficit of $985,268. This is down from the previous report in which the deficit was over $1.5 million. The CTU received no dues the first few months of the fiscal year and now that monthly dues receipts are coming in, she expects the deficit to shrink further as the year progresses. C. Financial Secretary – Maria Moreno. Maria spoke briefly on the upcoming CTU elections for officers. She also reminded the House of the upcoming “Polar Plunge” on March 3 to raise money for kids with special needs. If you are not willing or able to take the plunge into the Lake, contact the CTU to make a donation. D. Vice President- Stacy Davis Gates. Stacy spoke about the CICS strike. She said that CICS CEO, Elizabeth Shaw, (daughter of former newsman and now BGA head Andy Shaw), needs to be reminded of her responsibilities and asked everyone to call her and tell her to get to the bargaining table. She can be reached at 312-651-5000. Stacy warned that polls show Preckwinkle and Daley are neck and neck and we have to make sure we go with candidates who are favorable to our interests, not Daley. President’s report – Jesse Sharkey. Jesse made reference to the upcoming CTU election, stressing that although we may have strong disagreements within the Union, it is imperative that we present a united front to the CPS and to the public. He said we need to be united because of the upcoming contract talks. To that end he wants some of the bargaining sessions to be open to the public and he also said that he does not intend to have any last minute, late night settlements. Jesse also spoke of the importance of the two strikes by CTU charter school teachers and the precedents that they have established. With elections looming he said it is important to be involved in the political campaigns. He said it is uncomfortable to hear of our endorsed candidate and her connections with Burke, but this is not a perfect world. A. The Union endorsed more candidates for alderman. This was supposed to be done at the January meeting but we ran out of time. We endorsed candidates in the 18th, 19th, 23rd, 26th, 28th, 30th, 30th, 41st 44th, and 48th wards. You can contact the Union to find out their names if you live in those wards. Two candidates for the 14th and 47th wards were not endorsed. Although the PAC Leg Committee backed them, they were rejected by the House. In both cases, some delegates tried to have us endorse other candidates. In the 47th Ward, a CTU member is running and she wanted the CTU endorsement. The vote to endorse alternative candidates failed by 12 and 7 votes, respectively. With the vote being so close, Vice President Gates went to the microphone and motioned that we stay neutral in those two wards. Her motions carried overwhelmingly. B. The House approved the rules for the upcoming CTU elections for officers and delegates to the AFT and IFT conventions. C. The House approved the “Resolution for Black Lives Matter at School Week of February 4-8, 2019”. This was also left over from the January meeting. A. Organizing – Rebecca Martinez. Rebecca asked those who can to support the picket lines of the CICS strikers, especially at the Wrightwood School location. 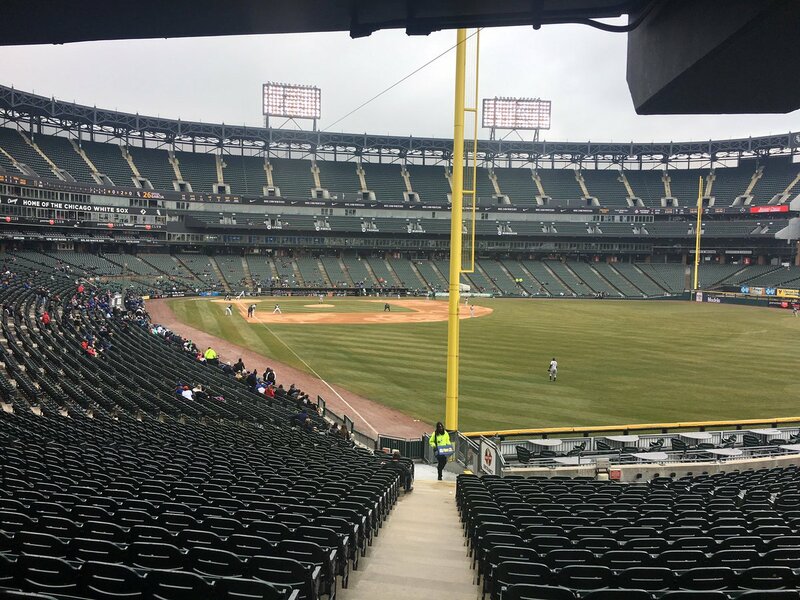 One of the few fans at the White Sox home opener in 2018 was a CTU members whose principal violated the contract by denying the member's personal business day. CTU Field Representative Joey McDermott reported at the House of Delegates meeting that CTU won the grievance.B. Grievance – Joey McDermott. The CTU has won an arbitration case regarding a Union member who was denied a PB because he/she had revealed how he/she intended to use it beforehand (i.e., telling the principal one is taking a PB to go to the Sox home opener). There are over 50 grievances from last year regarding the CPS refusing to reimburse teachers for spending their own money for supplies. The CTU expects the money to be issued to the affected teachers soon. There are similar grievances for this school year in the pipeline. Joey said that the CPS is not spending money as per the Agreement on alleviating class size because there have not been many complaints filed. He urged teachers to use the Class Size Referral forms provided by the Union . Joey also mentioned that the Acero strike won an important benefit for those charter teachers. Zero percent of test scores will be used in determining their ratings, which is a good precedent for our negotiations. Teachers should be aware that the CPS has a policy of immediately removing anyone from contact with students if there are any allegations of impropriety, even if there is no proof. C. Pension – Mary Sharon Reilly. Mary Sharon urged everyone to check the CTPF website. Starting in 2011 a State law established a two tier pension plan. Those hired after January 1 that year have different requirements to get a pension. [Reporter's note: They are getting screwed.] One should check the website to get an idea of what one’s pension will be. Did I read that correctly? We are going for an overall 5% raise and a one year contract?! Does anyone remember back in 2011 when the CTU did not fight for our increase in are salary 2011- 2012 school year. with the reply we will get it back during the contract. We never received our money. Matter a fact we lost more, positions were CUT, Reach was not even considered defending,like getting RID of. Yes the caucus in charge was new but they are clueless of what's going on in the classrooms. Let me mentioned Substitutes it was stated by The head of the grievance department if things aren't right file a grievance, then certain individuals in that department play god to decide if the substitute is worthy of there assistance.